The %99 have always struggled against the top feeding %1. Good or bad, Mr Berkman took the bull by the horns. This years festivities will take place at Modernformations (http://modernformations.com) 4919 Penn Ave Pittsburgh, Pa. 15224. Two house bands- HOA and dSBCb will provide music for the DVD release of Tony Buba’s Playing to an Empty House at Xmas. 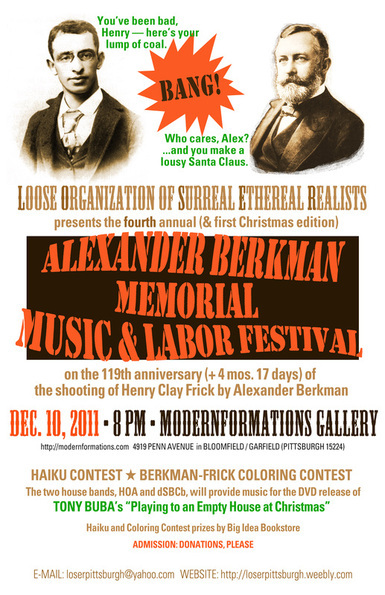 Prizes for the best Berkman Fest haikui as well as the best Berkman/Frick coloring contest.